2015 Lund 2075 Pro V, 2015 Lund 2075 Pro V - LBBHF537A5152015 Mercury 250 HP - 2B1419502015 Mercury 9.9 HP - 0R6315122015 Lund Bunk Trailer - 1MDAPAU21GA577144The 2075 Pro-V provides everything a fisherman needs in a new aluminum fishing boat and more. This aluminum boat is designed to deliver the most productive fishing experience for any specie of fish including walleye, musky, salmon, crappie, or bass. The legendary Lund 2075 Pro-V delivers superior design with almost every fishing boat feature imaginable in a nearly 21 boat.Please ask about the availability of NO MONEY DOWN FINANCING!- Mercury Marine Engine Factory Warranty - - 250 HP: 6/21/2020 - 9.9. HP: 6/21/2018- Lund 2075 Pro V Hours - - 76 Hours - - Included Options - - Spare Tire with Mount -- Minn Kota Ulterra Trolling Motor 112#, US-2, 60' - - Minn Kota Battery Charger - - Minn Kota I-Pilot Link with Remote - - SmartCraft Gauges - - 2 Minn Kota Down Rigger Units - - 2 Lund DownRigger Brackets - - Sport Track - - Lowrance HDS - 12 Gen. 3 @ Console- - Lowrance HDS - 9 Gen. 3 @ Bow -- Bimini Top with Storage Compartment - - Washdown Option with Hose - - Infinity FM/AM Radio with Bluetooth Connection -- USB/AUX Input - - Battery Condition Gauge - - Additional Clear Canvas Top - - Custom Dual Axel Lund Bunk Trailer -- Black Travel Cover - - Specifications - - Min/Max Horsepower: 150/300 HP - Min/Max Horsepower MPH (Approx. 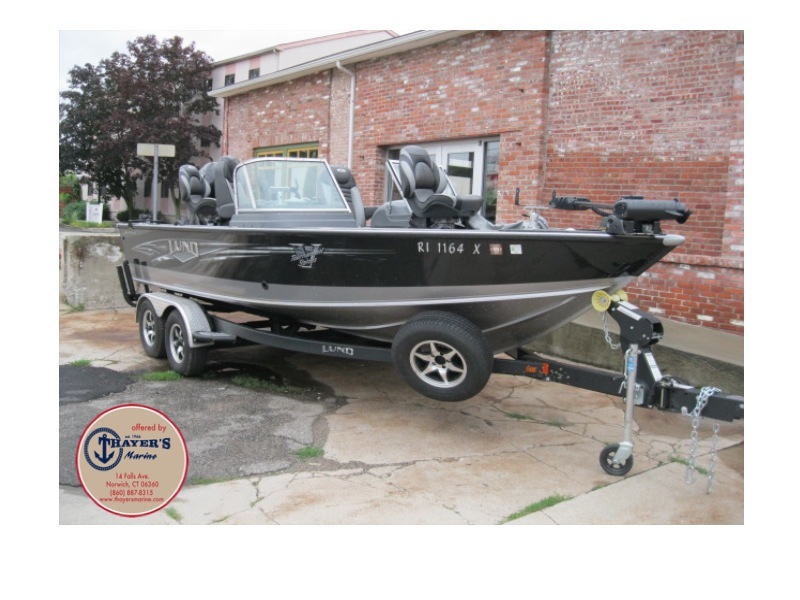 ): 43/62 MPH - Boat Length: 20' 8' - Boat/Motor/Trailer Length-Storage: 23' 4' - Boat/Motor/Trailer Height: 6' 10' - Boat/Trailer Width: 8' 6' - Boat/Motor/Trailer Towing Weight (lbs): 3780 lbs - Beam Width: 97' - Chine Width: 87' - Amidship Depth: 39.5' - Bow Depth: 42' - Transom Height : 25' - Standard Boat Weight (lbs): 2000 lbs - Maximum Persons: 7 - Capacity (lbs): 2100 lbs - Fuel Tank Capacity: 62 gallonsThree generations of boating know-how make Thayer's Marine, Inc. your leader for everything boating. With over 100 years of boating experience, we have learned what works, what doesn't, and pioneered what will. Our sales department works to find you the boat of your dreams, our parts department helps get you back on the water, and our service department fixes those problems you cannot, the first time. Oh, and CSI scores in the upper 95 percentile to back it all up.